* Boston Marathon – Monday, April 16, 2012. Room at Lenox hotel secured for runners, family and friends. Showers for runners will be available after race. Room at Lenox is being held under name Weinberger. * Bill Masterson compiled list of marathon runners who will be participating in this year’s Boston Marathon run and mentioned all of those who will be participating. * The Town of Chatham will be celebrating it’s 300th year anniversary. More discussion on how to promote the Chatham Harbor Run. Plan is to speak with the race director, Larry Belliveau, about expanding race this year. 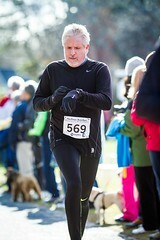 * Joe Weinberger is starting for 2012 his beginners running club. * A new Youth Run will be held this Patriot’s Day at Hathaway’s Pond in Barnstable which is being hosted by the Rec. Dept. * Mary Duchesney discussed the Relay for Life run which will be held on June 15th and 16th this year. Still available for sign up. Team raised $650 so far. Cancer survivors dinner will be held on Friday evening. Also luminaria and tee-shirts will be available. Anyone interested in joining needs to raise $100 in order to get a tee-shirt. * Elections held this evening – Dwight Pfundstein was elected as a Board Member. Larry Cole was elected as President; Howard Tansey was elected as Vice President; Adam Ross was re-elected as Treasurer and Mary Ellen Ross was re-elected as Secretary. * Next CCAC monthly meeting to be held on Wednesday, May 2, 2012 at Dennis Senior Center. On one of the warmest Patriot’s Days in 116 years, ALL CCAC team members finished, many under very difficult conditions of pain and discomfort. 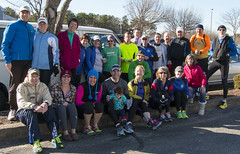 Temps ranged from 69 degrees at the start, to the high 80s when these folks finished. The course was sunny and dry and HOT. Despite the weather, there were many accomplishments worth noting, a few of which I will point out here, in no particular order, except that I am biased in favor of the older runners 🙂 Bob Eckerson battled knee pain in both knees. Pete Stringer finished 18th M70-74. Larry Cole finished 21st M75-79, at age 78. Patrick Clark set a great example for the students of the high school where he is the principal. Hilary Green raised a bunch of money for the American Red Cross; she is the new Executive Director of the Cape Cod Chapter of the Red Cross. Janet Kelly finished 13th F60-64. Heidi Russell finished 65th F50-54. Steve Sullivan battled hip pain big-time. I’m sure there are more back stories that I am not aware of, but these are a few that I heard about. CCAC Men’s Open Team, 13:43:57, 58th out of 59 teams. 20855, 61, Bob Eckerson; 5:23:31. 21198, 65, Harold Robinson; 5:23:09. 22749, 78, Larry Cole; 6:23:31. CCAC Men’s Masters Team, 12:29:15, 63rd out of 68 teams. 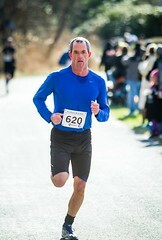 9907, 59, Steve Sullivan; 5:05:38. 22683, 49, Scott Woelfel; 6:16:57. 23642, 47, Howard Tansey; 4:16:16. 25562, 48, Chris Malone; 5:11:53. CCAC Women’s Open Team, 15:34:22, 51st out of 51 teams. 23659, 34, Nicole Spencer; 6:28:56. CCAC Women’s Masters Team, 12:52:42, 27th out of 37 teams. 20415, 52, Sue Shanley; 4:48:32. 20490, 45, Mary Duchesney; 4:59:03. 20833, 58, Jane Lovelette; 5:50:02. * denotes scoring member, one of the top 3 times on the team. 2:49:47 Tom Deeg, 212th overall, out of 22,000 finishers. 3:00:16 Justin Deeg, 400th overall. 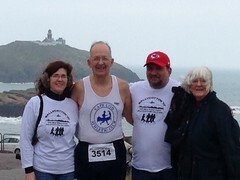 4:07:29 Bill Lord, 18th M65-69. 7:14:28 Kevin Petrovek, 38th consecutive Boston, one of 46 people who have completed 25 or more consecutive Boston Marathons. Doing Boston? Send us your bib number and we’ll add it to our list and post finishing times when they’re available. Tracking somebody at Boston? 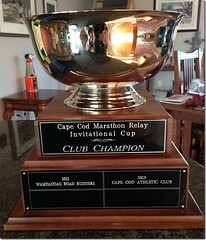 Visit the list of all Cape Cod starters, find their bib number and follow them on-line. And good luck to all who are tackling the beast! More Boston – the club has the usual hotel room at the Lenox for after the marathon. Ask at the desk for either Joe Weinberger’s room or the Cape Cod Athletic Club. Come on up for a shower, some post-run recovery, and tales of woe and triumph! Many more CCAC members and friends will be working the marathon so wave at Cathy Lohse and her MMA recruits in Food, Geof Newton in Gatorade Recovery, Rich Havens who will be frantically racing back and forth through the finish system, Mark and Susan Snyder on the big lifeguard chairs, and all the club members along the route! … and more Boston – Kevin Petrovek’s bus leaves at 7:00AM on Marathon Monday. We hear that there are still a few seats available so call Kevin at Hanlon’s Shoes at 508.775.8877 if you’d like to take the easiest path to the starting line. No Boston? Gene Cormier invites you to the Robert Stone Memorial Road Race on Saturday and if you’re in the mood for something a little longer, how about the inaugural Cape Cod Half Marathon in Hyannis on Sunday? … and not to be forgotten, the election returns have been processed and counted with the following results. We welcome Larry Cole and Howard Tansey to the positions of president and vice president respectively; the treasurer and secretary duo of Adam Ross and Mary Ellen Ross return for another year of service; and Dwight Pfundstein will be replacing Larry Cole on the Board of Directors. Congratulations to all!